11.75"x.810" rotors, 'Kelsey Hayes' 4 piston calipers with Porterfield pads, no parking brake. Fits 15" aluminum wheels or larger. When building a maximum performance street or track car you find all sorts of weaknesses in the stock components. One major component that desperately needs attention is the stock rear end. Its semi-floating design allows the axles to move back and forth slightly on square roller bearings. 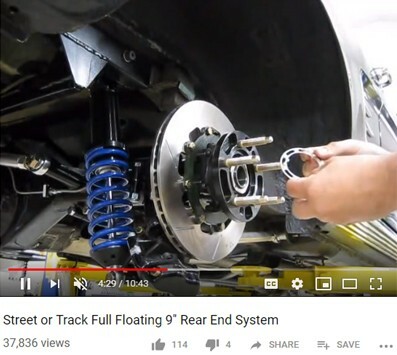 If you want to run serious rear brakes in the form of a fixed caliper, you'll find this movement pushes the pads away from the rotor when cornering, only to really get your attention when you need to brake for the next corner. You end up pumping the pedal or have a very long pedal as you have to move the pads back to the rotor face before any friction can occur and slow the car. Not an enjoyable feeling. A much more preferable situation is a pedal that is in the same position every time and having amazing stopping ability each and every time you step on the brake pedal. Brakes are not optional! One other major safety concern with the stock rear end housing and axle design is that if you break an axle in the right spot, you can loose a wheel! Think about it. All that holds your wheel on is the flimsy stock bearing retaining plate and the bearing being pressed onto the axle. If the axle breaks on the outboard side of the bearing or the bearing fails the wheel is able to fly off in a direction you don't really want it to go! With today's sticky tires and modern suspension designs exerting way more loads onto components that were originally designed for skinny bias ply tires, we should all take a long hard look at these critical safety areas of our cars. 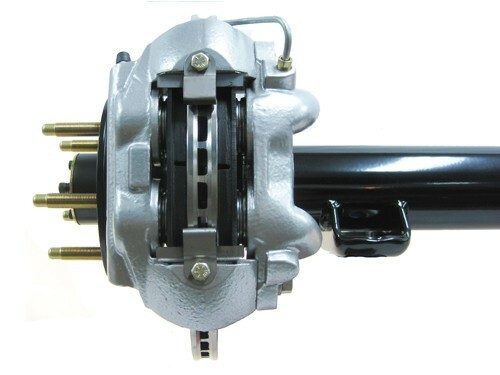 Our Full Floating 9" Rear End System eliminates pad knock back and removes the safety concern of breaking an axle. The weight of the car now rides on the housing, not the axle like the stock design. 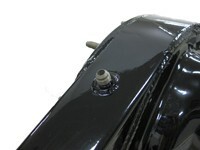 "The ULTIMATE rear end for your Hot Street, Pro Touring, Drag or Road Racing car"
Housing features a fill, level and drain plug. These can also be used to plumb a rear end cooler. 7/16" stud is welded to the top of the drivers side axle tube. Picture shows our intermediate brake hose ready to be secured with a nut (hose not included). Baffled -6AN vent fitting allows for easy and convenient vent hose connection. 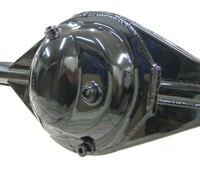 Brand new, heavy duty 9" housing with full 3" O.D. axle tubes. Brake brackets, leaf spring saddles, Watts Link and/or trailing arm brackets come installed and are beautifully and professionally Tig welded, then the housing is straightened to ensure trueness. Housing is powder coated gloss black and looks almost too nice to install out of sight under your car! 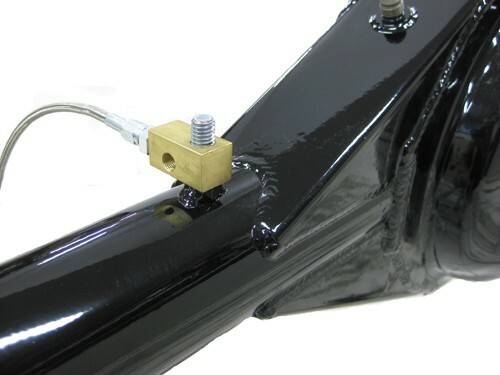 Housing includes a baffled -6AN vent tube on the LH side, fill, level and drain plugs and a 7/6" stud on the LH axle tube for brake flex line mounting. Solid premium alloy steel, double heat treated, 31 spline, fully polished axles. Axle installation and removal tool included. Axle tube seals. These install in the housing to keep gear lube from migrating down the tubes and keep it in the center section of the housing. Forged 4140, heat treated steel hubs with races pre-installed. 3" long 1/2-20 ARP bullet nose wheel studs pre-installed into hubs. Massive tapered roller bearings, keyed washer, nut and lock ring. Special spindle nut socket included. 11.75" x .810" heavy duty rotors mounted to steel rotor adapters. Packages under most 15" aluminum wheels without wheel spacers. New casting Kelsey Hayes calipers with stainless crossover tubes and Porterfirled R4-S pads. Specialized spindle nut socket included. Inner axle tube seals included. For 65-66 Mustangs our system is built 57.25" wide measured from wheel mounting surface to wheel mounting surface. For 67-70 Mustangs we build them 59.25" wide. This measurement is taken from the drum or disk face your wheel mounts to. If you need it wider or narrower please contact us. Please note that custom ordered housings are non-returnable. If you order it, you own it. 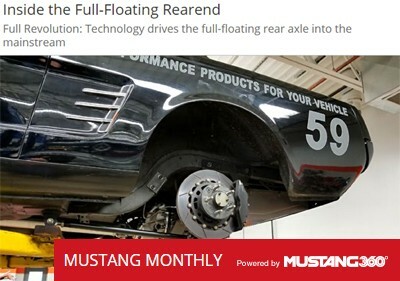 Leaf spring pads are installed 43" on center which is the stock location for 65-70 Mustangs. If you need them in a different location, please contact us. Leaf spring pad to pinion angle is 3 degrees up. If you need a different angle please let us know. Pinion is located 3/16" to passenger side which is standard for 65-70 Mustangs. If you need it offset one side or the other please let us know. 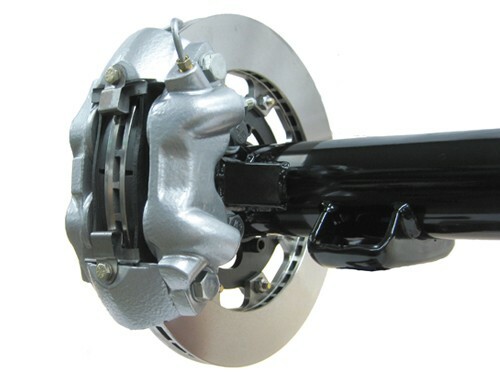 A 7/16" x 1-1/4" long stud is welded onto the top of the drivers side axle tube 17" in from the wheel mounting face to enable easy mounting of brake line blocks (please see picture above). A -6AN vent tube is welded on the drivers side of the housing (please see picture above). 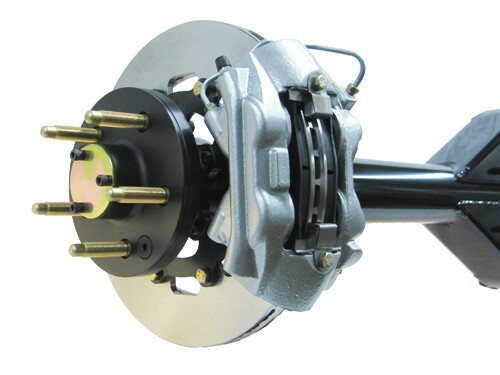 Standard hubs use the Ford 5x4.5" bolt pattern. Other bolt patterns are available. Please note that if you decide to change any of our standard dimensions the housing is considered custom and is non-returnable. Please measure twice and order once. System is shipped ready to install. Simply pack the wheel bearings, install the hubs, run brake lines, add your center section, install the axles, fill with fluid and its ready to run! Our housing is highly customizable and can be made wider/narrower, shipped with or without leaf spring saddles, painted or bare. If you have a custom application let us know and we will try our best to accommodate you! All systems are built to order, please allow approximately 6-8 weeks build time.